This wasn’t a bus trip, but it is an annual outing for us. Thursday was the best day in my opinion to attend the festival. It started off rainy, so I didn’t take my camera, but by the time we got there is was 85 and humid! So much for Spring. The first band we went to see is what we thought was John Primer. He is my personal favorite Chicago Bluesman, but he didn’t play. the band we saw was very good Big Ray and Chicago’s Most Wanted. The second band was very inspirational to me. We had the honor to stay in a room he stayed and was named after him at the Shack Up Inn located in Clarksdale, MS. For those who don’t know….. this is where the the crossroads are located that Robert Johnson sold his soul to be a great guitar player. anyway . . . . this man is a legend Pinetop Perkins. He is 95 years old and still playing. He only played 2 songs but it was a real treat to see him. I did catch a photo with my phone, which is suppose is better than nothing. Also playing in the band was harp player Willie “Big Eyes” Smith and on the bass was Bob Stroger And on Guitar was Bob Margolin, who co-wrote music and played with the late great Muddy Waters. was lucky enough to capture a photo of him. By then it was dinner time and as we walked to the resturant, we walked by the Gibson Guitar bus, which Taylor imediatley had to check out. He did get us a tour of the inside of the bus. Very nice. Many guitar’s, amps and keyboards. I would not mind taking a road trip in that! Of course he had to check out the guitars. 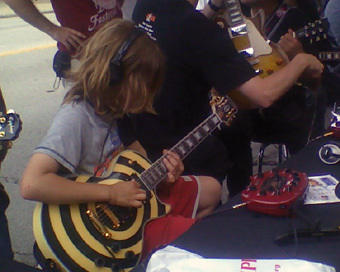 Here is a picture of him playing an Epiphone Zakk Wylde Les Paul. After dinner, Marilyn and the boyz went home, and stayed for the head act. Johnny Winter and James Cotton as usual he was phenomenal. I think the last time I saw him is when I lived in Dallas. He played inside the Petrillo Music Shell. I got lucky and was able to get inside the shell, but never got a chair. I just stayed one step of security and stood as close as I could. All in all a great night of blues.